In the Manuscript B, there are hundreds of drawings and notes about the architectural elements of an entire city, everything from a hoe to hydraulic systems. We can identify the parts of a kind of “builders’ manual” among the pages, with indications of materials and methodologies. 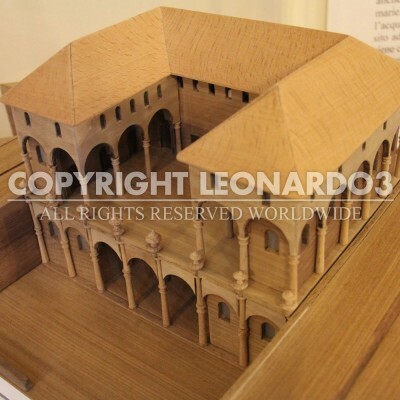 Leonardo did not invent all of this on his own; but he did observe it. Moving around a busy city like Renaissance Milan, he took notes and made drawings of everything he found interesting or useful for becoming an architect. Not only did he make centralized plans of existing churches and buildings, but he also added his own thoughts and innovations to the efficiency and aesthetics of the buildings. The adjective “ideal” must not be interpreted as referring to the beauty of its buildings, but rather to the perfection of the city’s “machinery”. Everything had to work perfectly, especially the circulation of things and people, as well as cleanliness and hygiene, which have always been primary concerns in the design of a city. Water is the energy that allows the Ideal City to function. The city’s design starts with the choice of a suitable site with a river running through it. 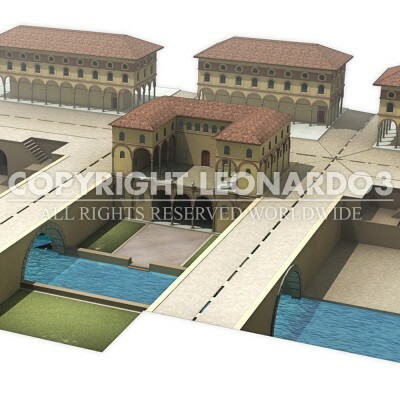 The river becomes divided and diverted into canals laid out according to a regular geometric structure. All the buildings and structures are to be built alongside these canals. They enable boats to navigate throughout the entire city and their waters make the sewers work.